Eredivisie Live offers exclusive live coverage of the Eredivisie in the Netherlands. It also offers other live international football coverage. 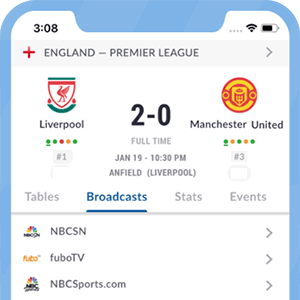 The service is offered in multiple channels in order to offer multi-selection options for viewers when there are concurrent matches being broadcast live. The channels are Eredivisie Live 1, 2, 3, and 4. *Got itLive Soccer TV does not provide Fox Sports 2 live streaming. The information provided on this page is simply Fox Sports 2 soccer TV schedule.